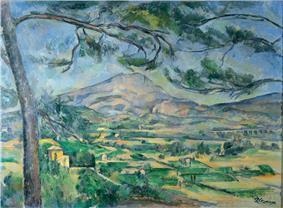 Mont Sainte-Victoire is a series of oil paintings by the French artist Paul Cézanne. The Montagne Sainte-Victoire is a mountain in southern France, overlooking Aix-en-Provence. It became the subject of a number of Cézanne's paintings. 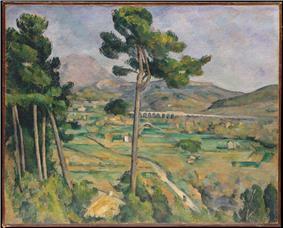 In these paintings, Cézanne often sketched the railway bridge on the Aix-Marseille line at the Arc River Valley in the center on the right side of the picture. Especially, in Mont Sainte-Victoire and the Viaduct of the Arc River Valley (1885–1887), he depicted a moving train on this bridge. Only half a year after the opening of the Aix-Marseille line on October 15, 1877, in a letter to Émile Zola dated April 14, 1878, Cézanne praised the Mont Sainte-Victoire, which he viewed from the train while passing through the railway bridge at Arc River Valley, as a “beau motif (beautiful motif)”, and, in about that same year, he began the series wherein he topicalized this mountain. These paintings belong to Post-Impressionism. Cézanne is skilled at analysis: he uses geometry to describe nature, and uses different colours to represent the depth of objects. This painting (with large pine) was on display at the Armory Show 100th Anniversary in New York at the New York Historical Society. ^ Paul Cézanne, Correspondance, recueillie, annotée et préfacée par John Rewald, nouvelle édition révisée et augmentée, Paris: Bernard Grasset, 1978, p. 165. ^ "Tomoki Akimaru, "Cézanne and the Steam Railway (1)~(7)", Japan, 2012". Tomokiakimaru.web.fc2.com. Retrieved 2014-03-22.